During this event, new costume employees with hot springs clothing appear! ※ The above 6 employees will only appear during the [Oyupani♨Steam and That Girl and Bathtowel] event and will have resume appearance rates higher than normal employees. Furthermore, using the [Limited] Hot Springs Postbox will increase these chances. ※ The above 6 employees can be recruited from the rewards received from the [Oyupani♨Shinestone Purchasing Campaign]. ▼ ★4★3 Hot Springs Costume Employee present! Log in during the event to receive a [Limited] ★4★3 Hot Springs Envelope (3 letters) x1 as a present! The [Limited] ★4★3 Hot Springs Envelope (3 letters) is a special envelope that contains resumes from the costume employees [Gilmir], [Rui], and [Lise], and you can pick one of them! ▼ Spend time together with the girls! During [Oyupani♨Steam and That Girl and Bathtowel], you can pick between the three girls [Nomadoa], [Elsa], and [Sarah-Moon] to spend time with together at the hot springs. Once your selected girl reaches 100% intimacy, you will receive a special present from her. ※ You can change your selected girl at any time. Even if you change, the intimacy earned on her will not change. ※ You can increase the intimacy on all three employees. ※ Intimacy earned from quests will only apply to that quests's specific girl. ▼ Enter the Hot Springs! During [Oyupani♨Steam and That Girl and Bathtowel], your employees can enter the women's bath from the special event page. Employees who are enjoying the baths will gain EXP. Employees who have left the bath will have a rested condition and cannot re-enter the bath for a certain amount of time. Every day at 04:00 JST, the special event page will reset to a [Daily First in the Bath] status, and the employees who enter first will receive a 1.5x EXP bonus from the Hot Springs. ※ If an employee is still bathing when the event ends, they will not receive the EXP. Choosing a rested employee and selecting the [Finish Resting] button can allow an employee to enter the Hot Springs again. To immediately end the resting condition, you can use the event item [Limited] Mysterious Fan or a [Shinestone] is required. During [Oyupani♨Steam and That Girl and Bathtowel], the special event page has a men's bath, where you can listen to the conversations between employees happening in the women's bath. The details of the conversations changes depending on which employees enter the bath. After listening to their conversations, you may receive an item. 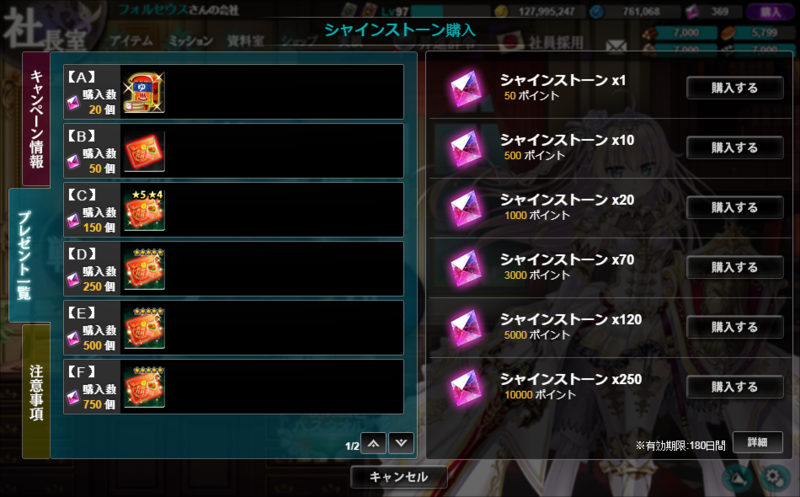 These items have no particular effect and are labeled as [Mementos] which can only be obtained during the event. In the men's bath, Sho Fujiyama and monsters may appear. Clicking on either of them will make items appear. After receiving the items, these two may reappear again after a certain amount of time. The special event page has a gift shop you can visit. ▼ Increase the Gift Shop Lineup! 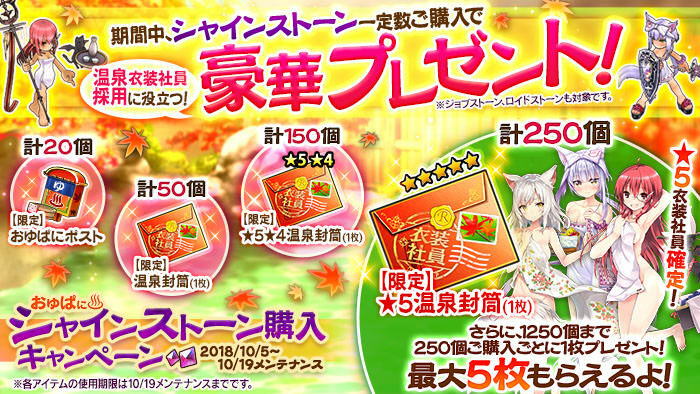 By spending more [Limited] Hot Spring Tickets, the gift shop will increase the amount of items they carry. The Golden Geyser is an [Urgent Quest] that can only be sortied to at specific times. The Urgent Quest [Golden Geyser] can drop valuable items such as [Limited] Fairy's Sweet Sake and [Limited] Mysterious Fans. In addition to this, it provides a very large amount of EXP and Gold. When the Urgent Quest is available, an [Invitation Ticket] will be available from the special event page. Their distribution times will be published one week in advanced and available in the official community notices. ※ [Urgent] Invitation Tickets and [Limited] Invitation Tickets purchased from the gift shop unlock the same map. ※ The [Urgent] [Golden Geyser] Invitation Ticket will unlock the quest for 30 minutes when used. ※ The [Urgent] [Golden Geyser] Invitation Ticket can be used at any time of the day before it expires. ※ The [Urgent] [Golden Geyser] Invitation Ticket will expire 24 hours after its distribution time. ※ The [Limited] [Golden Geyser] Invitation Tickets from the packages in the Shop expire on 10/19 (Fri) and can be used any time during this event. The event item [Limited] Local Unfiltered Sake can be used to increase the EXP gained. Even recipes can be obtained from the event quest and gift shop. Each weapon recipe has a chance to randomly craft 1 of the class's event weapons. The gift shop also has event accessory recipes available for exchange. Equiping the event weapon will give employees a new in-battle graphic where they are in Hot Springs attire. Unlocks the [Golden Geyser] Quest which gives large amounts of EXP and Gold for 30 minutes when used. Expires 24 hours after the distribution time. Please check the distribution times for more details. Last edited by Folseus; 10-12-2018 at 07:19 AM. Last edited by Mikan; 10-05-2018 at 09:18 AM. does Oyupani means anything at all? Anyways this seems to be like the summer event, exept that we can date all three girls. Will there be multiple parts with 6 girls each? I expect that. @Eve It's sort of a cute contraction thing. In Japanese the game is "Kanpani Girls" so the abbreviated version of that is "pani." So event names are usually something related to the event on hand, plus "pani." So the summer events are typically referred to as "natsupani" (natsu = summer, pani = kan(pani) so "Summer Company Girls." Oyu is hot water (as kurayami pointed out). As hot springs or baths involve hot water, oyu is used in reference to baths in Japanese, similar to how "waters" is sometimes used in English when referring to bathing at spas ("I thought I'd go check out the waters" or "I'm going to get cured by the waters."). So oyu + pani = "Company Girls at the Baths." 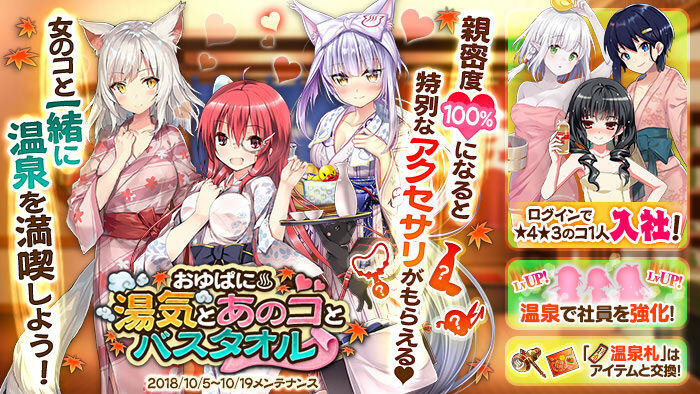 I expect this event to only last two weeks with no additional girls, and immediately after to have two weeks of a Halloween event but who knows. @kyoshiros I've updated with the event item descriptions. 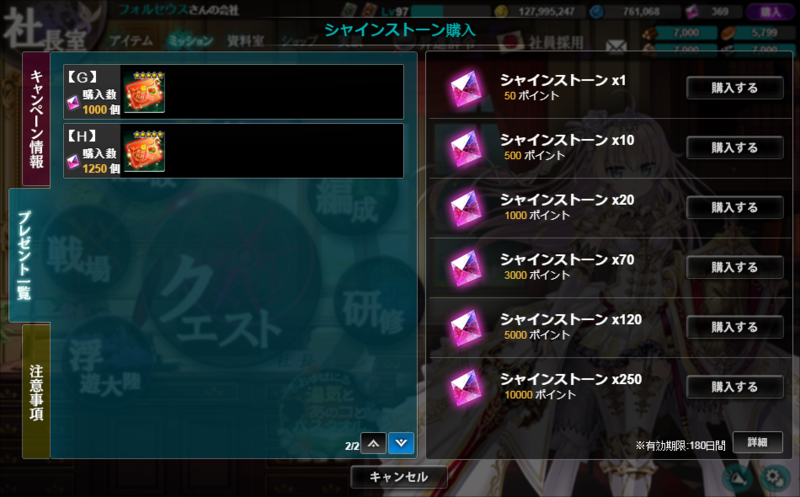 There are 2 maps in exp ticket, whats it?